A series of 4 Screenprints based on a large figure composition. 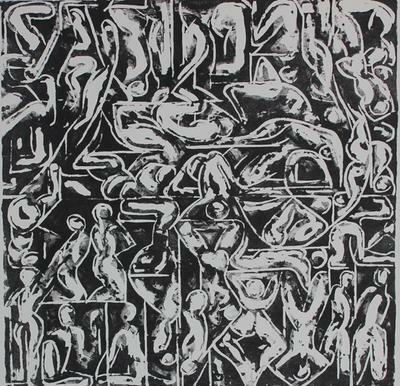 A series of 6 lithographs which are variations based on a large multiple figure composition. A series of 3 lithographs in the “Sleepers” series, based on head and shoulder painted studies done in the studio from the model. 9 large paintings in the “Configuration” series. 6 small paintings in the “Sleepers” series. The paintings are composed from figure drawings done in the studio from the model. Life drawing has always been an important and continuous part of my artistic practice. After many years of drawing and painting from the figure the idea came to me of making large compositions of multiple figures from all the drawings I had produced. I then started drawing specifically for certain compositional requirements. 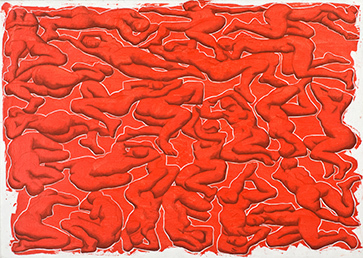 The paintings are more about rhythm and patterning than about the figures themselves. While the figure is three dimensional the compositions themselves are essentially a flat patterning - intended to be more like writing than the traditional ‘view through a window” of western art. Using models in couples was to make the implied space more 3 dimensional with figures coiled around each other while retaining the 2 dimensional picture surface. This increases the tension between the 3 dimensions implied by the subject - the figure - and the 2 dimensionality of the image. The human figure is instantly recognisable to all of us. To use unusual and varied points of view teases the view and stresses the 3 dimensions. 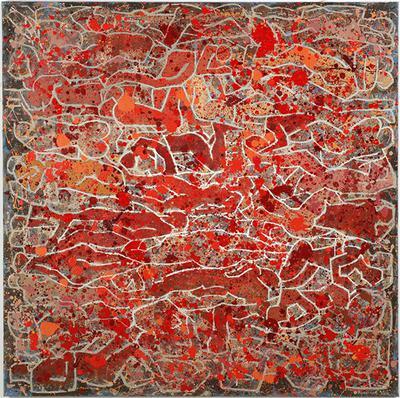 The manner of composing/painting stresses the flatness of the canvas surface. “Big Sleepers” is an early painting in the series and the figures are more naturalistic. The more recent paintings such as “White Knot” and the lithograph “Reduced Circus” are more abstract and closer to just marks on the surface - but never lose their reference to the figure. I am interested in pursuing the direction of reducing the clues to the figures with the composition to the point where they almost disappear and become subliminal. The square format gives equal importance to all sides and some of the paintings are intended not to have a “right way up” but can be hung any side up. A circular compositional would be logical but not practical. The prints are developments of the paintings. After doing a whole degree course in printmaking years ago I hadn’t had the chance to continue with stone lithography until I joined a workshop at Editions Tremblay, Cairns, Far North Queensland. This was a wonderful opportunity I had been hoping for years to find - a fully equipped printmaking studio plus teaching and mentoring from a master printer - Theo Tremblay, also the opportunity to work alongside some excellent artists. I continued on with some etchings and the series of screenprints and lithographs in this exhibition, which were produced there and editioned professionally by Theo. My thanks to Theo for his contribution also Paloma Ramos and Canopy Art Centre for the opportunity to exhibit and to the Queensland Government which made this latest series of prints possible with a grant. This latest series of prints was enabled by funding from the Cairns Regional Arts Development Fund. The Regional Arts Development Fund is a Queensland Government through Arts Queensland and Cairns Regional Council partnership to support local arts and culture.